Form flowers are the colorful, large and often unusually shaped blooms floral designers use to center their pieces. They are the first to draw a viewer's eye into an arrangement. Expensive and high-impact, form flowers are best used in moderation. Think "too much of a good thing," if you are tempted to go overboard when designing with these showy blooms. 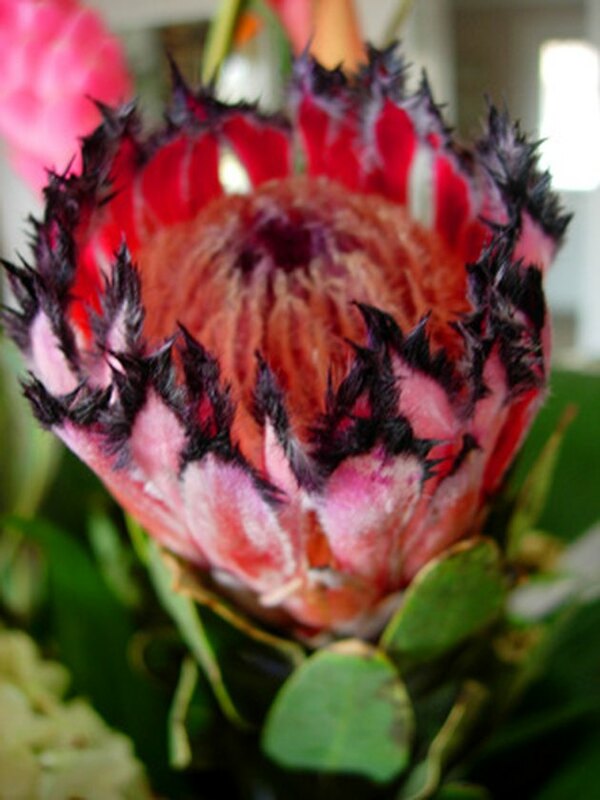 Proteas are dramatic tropical form flowers. Native to Africa, protea shrubs have striking goblet-shaped blooms with exceptional vase life. The cut flowers retain their form and color for up to three weeks, according to Bella Online's Floral Design Editor, Connie Krochmal. Often resembling artichokes, the flowers have plumed centers nestling inside layers of showy, colorful bracts. At up to 8 inches across, King protea (Protea Cynaroides) is the largest of these form flowers. It has white stamens and bi-colored bracts in shades of cream or yellow with pink or red. A form flower of these dimensions will dominate a small floral design. 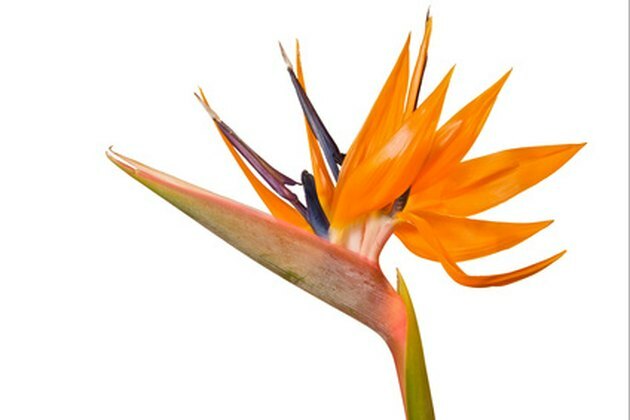 Strelitzia, or bird-of-paradise, is an angular form flower. Strelitzia (Strelitzia reginae), commonly called bird-of-paradise, has a distinctive, green, beaked bract and plumage-like yellow, orange and blue petals. Its angular form brings a geometric look to floral designs. Native to South Africa, the flowers come from 3-foot, clumping plants with flat, lance-shaped to oblong foliage. Their dark green leaves, up to 18 inches long by 6 inches wide, are frequent additions to tropical floral designs. Leave strelitzia's long stem as it is for tall arrangements, or cut it to the appropriate length for shorter designs. Anthurium is suitable for tropical or contemporary floral designs. Sometimes called painted tongue, anthurium (Anthurium andreanum) is native to South America, where it grows on rainforest trees. Its form flower consists of a single heart-shaped--usually red--leaf topped with a roughly textured white stalk, or spadix. The spadix contains its actual flowers. Some anthurium cultivars have purple, green, white or multi-colored leaves, according to the Floral Design Institute. 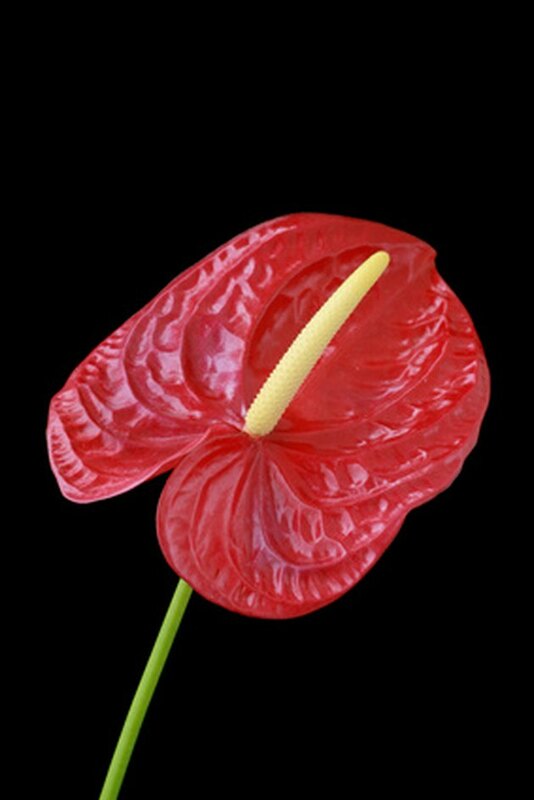 Its brilliant color and dramatic shape make anthurium a good focal point for tropical or contemporary floral designs. With proper care, blooms of some cultivars last up to 45 days. Irises bring mystery and motion to floral designs. Irises (Iris spp.) of all varieties have the exotic form and eye-catching colors necessary for form flowers. Their elaborately curving petals bring motion to a design, while their hidden stamens provide mystery. 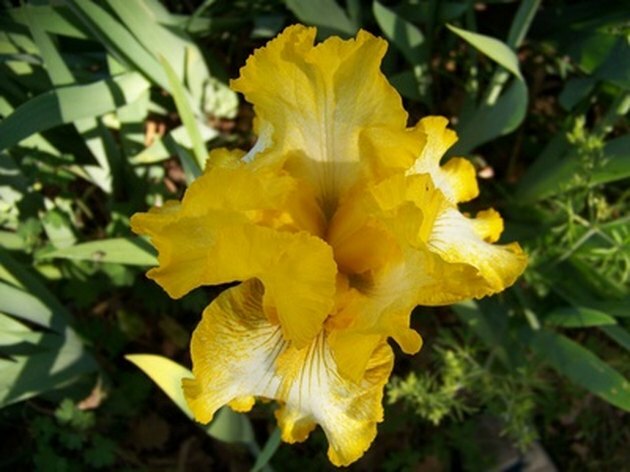 Although many form flowers have the most impact positioned along a container's rim, placing an iris on the perimeter of a design enhances its graceful profile. Leaving empty space around these flowers will also draw attention to their form and jewel-like colors.